The Road Accident Benefit Scheme (RABS) – Who Benefits? Treasury described RABS as the single biggest change in the South-African social security system in recent years. 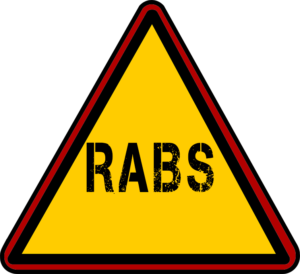 RABS, once implemented, will have adverse effects on the victims of road accidents and the South Africa public in general. Since the Parliamentary Committee on Transport (PCOT) requested oral submissions to be made and concluded same at the end of May 2018, the RABS Bill attained a motion of desirability and was referred for a “blitz” public participation and consultation process. It was only after the submission made by Treasury on the 21st of August 2018, that the Department of Transport (DoT) started to consider certain proposals, many of which was earlier expressed by various stakeholders during the oral submission stage. The RABS Bill was referred back to the PCOT, which immediately started with the next phase of clause by clause deliberations on the Bill. A clear definition as to what would be regarded as the Average Annual National Income (AANI). During one of the deliberations, Hon. Ramatlakana (MP) insisted that the DoT addresses these and other concerns of the PCOT immediately as they would want to vote on this Bill as soon as possible (end of November 2018 it was said). At the end of Parliament’s last term, it was planned that the RABS Bill (albeit an amended Bill) must be presented to the PCOT at start of the next term starting on 9 October 2018. As at the date of this article (16 October 2018) the RABS Bill has not yet been placed on the agenda of the PCOT and they are starting to run out of time, should they still intend to introduce the Bill to the National Assembly in 2018 – taking into account that the amended Bill would have to be published for public comment. Prior to the proposed changes suggested by the PCOT, the RABS Bill on its best case scenario, represented a 20% financial saving as compared to the current RAF dispensation. Having regard to the very sensitive balancing act between the affordability of a no-fault system and the structured benefits on offer by RABS, and having to still fund the RAF liability by limited revenue sources, the latest proposals by the PCOT might tip the scale and result in a much more expensive system. The proposed RABS “reforms are substantial and the financial implications cannot be accurately determined in advance” (as quoted from a National Treasury document dated the 5th of July 2018). This may result in costs spiralling out of control resulting in enormous financial implications for the taxpayer and which would most certainly result. The obvious revenue source impacted will be the fuel levy (which according to the True South report will have to be increased from R 1.93 to R 2.64, in current value) or by introducing a “special tax”, as per a statement by Hon. Ramatlakana. Preliminary calculations done by various actuaries based upon the new proposed changes, already indicate that RABS will be substantially more expensive, as opposed to the current RAF system. We trust that the PCOT will require a re-calculation by Messrs. True South (actuaries on behalf of the DoT) and allow a peer review, once the latest “amended” RABS Bill, is at hand. Mr. Gregory Whittaker (Actuary) is quoted as saying: “if you want two you need to be able to pay for two”. The funding model of the RABS scheme is of grave concern as it is fraught with uncertainties and will most certainly result in an increase in the fuel levy or would have to be addressed by some other additional tax. Mr. Ngoako Mohlaloga (founding member of APRAV) raised the view that: “it would only be Government that benefits from the proposed Scheme”. 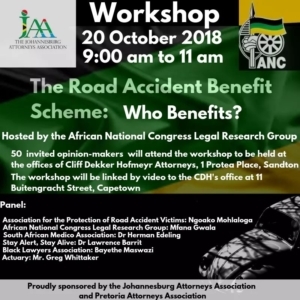 Without financial assistance and/or facilities to treat and rehabilitate victims, the South African road crash victims would be receiving less benefits whilst having to pay more. Adv. L Barrit (Stay alert Stay Alive) submitted a compelling and alarming comparative study on the road accident rate in South-Africa and re-affirmed the fact that Government should address the symptom and focus on reducing the carnage and accident rate on our roads whilst at the same time addressing the financial viability of the current RAF dispensation. A no fault system as envisaged under the RABS is the last thing the South African public can afford from a personal safety and financial point of view. 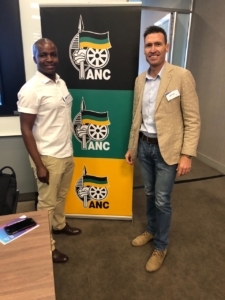 The ANC legal research workshop gave attendees the opportunity to meet with and discuss with members of the legal research group at a high level relevant issues contained in the current RABS Bill that were ignored during the public submission phase of the development of the Bill. 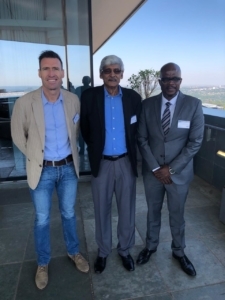 Mr. Krish Naidoo (leader of the ANC legal research team) closed the Workshop by thanking the panellists for their insightful inputs and requested that the inputs be reduced to paper to be distributed to the President, The Minister of Transport and the Minister of Finance. Everyone who attended the Workshop was thankful for the initiative taken by the ANC Legal research team and felt positive that these and other serious concerns now found the fertile soil required to develop dialogue and co-operation, by all concerned, as to allow for the formulation of legislation that would be to the benefit of all South-African citizens. Founding member of APRAV, Council Member of the LSNP and member of the Personal Injury Committee of the LSSA.